When you think of Baby Soaps what are the soaps that come to your mind? The trusted Johnson & Johnson, Himalaya? My quest for getting some different soaps for my boys made me discover Omved and Rustic Art. While I am a total fan of Omved, I bought the Rustic Art Baby soap because I had used other soaps from that brand. And I must say I was not disappointed. The soap is mild and has a lovely fragrance and like most Rustic Art soaps, you will need yo wet your palms and rub the soap between your hands and glide the hands over wet skin. The soap bar lasted 20 days for both the boys! Avoid using the soap on your skin directly, using it the way I have described makes all the Rustic Art soaps last longer. 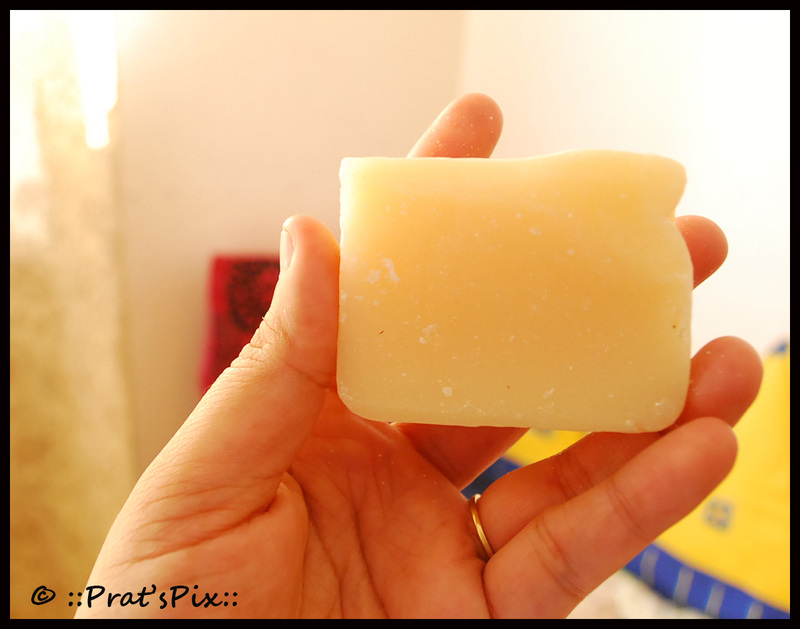 Price and Shelf life: All their soaps are priced at INR 155 for a 100gm soap bar. It has a shelf life of two years from the date of manufacture. Packaging: Most of Rustic Art soaps are packed in vibrant coloured cloth pieces. I love the packaging, not only is it different but also very attractive. Where can I buy this? : You can buy this online from Natural Mantra and Beaute Naturelle. I bought this at the flea market at Ishanya Mall in Pune from the Beaute Naturelle stall that Megs had put up. Will I recommend this? : Of course yes! I found this soap to be value for money and also it gave me the chance to try something organic and natural for my boys. So yes, I would recommend this. Key Ingredients: Organic Corn Oil, Organic Coconut Oil, Organic Castor Oil, Organic Neem Oil, Olive Oil (certified), De-mineralised water, Caustic Lye and certified organic essential oils based on the fragrance. Great Review Pratibha. I was shocked to learn that most baby soaps and oils contain mineral oil which are definitely not safe for kids and that is why I started looking for organic baby soaps. Rustic Art baby soaps are great and though they may not have those clever marketing shapes and packaging of barbie etc., the products are safe and natural which is what every parent wants. I’ve switched over to Rustic Art for quite a while now! I wish they had baby shampoos too! Would have made my life easier! 100% Natural Handmade Soaps by Leviv Naturals, Goa is equally good and real value for money. These synthetic colour , preservatives and fragrances free soaps cost only about 115 rupees for a bar of 120 gms, way much bigger than a Rustic art soap of 75gms which cost about 155 rupees. So i think you can have natural skincare luxury on a daily basis without burning a hole in your pocket. Thank you so much for stopping by my blog and introducing me to yet another brand. Where can I look up more info on the brand that you are suggesting? Can you please let me know? Would appreciate your help.